WHEELING, W.Va. — Beaver Local reigned supreme with the help of its youngest team members on Saturday at the 66th Ron Mauck Ohio Valley Athletic Conference Wrestling Championships at WesBanco Arena. Riding a wave of a school-record four individual titlists — including three freshmen — at the meet, the Beavers broke Parkersburg South’s five-year hold on the overall championship. It was the second overall title for the Beavers with the first coming in 2003. Parkersburg South is considered one of the best teams in the country with a current ranking of 38 in the Intermat High School Rankings. Winning titles for the champions were Jaymin Salsberry (106 pounds), Logan Ours (120), Brenden Severs (160) and Beau Smith (170). 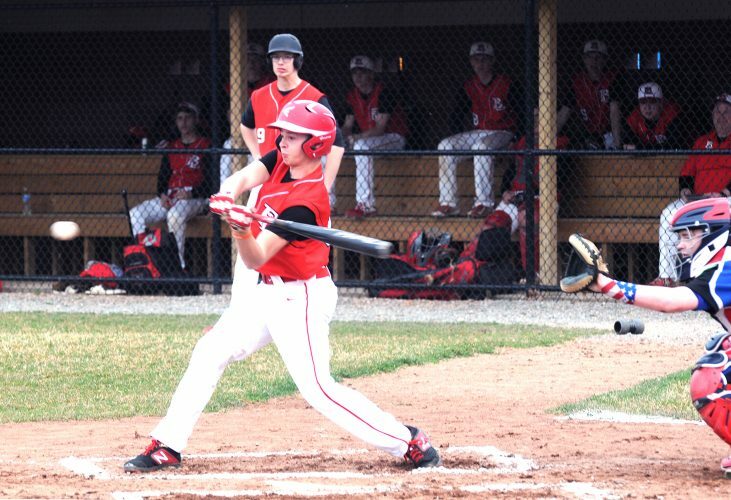 All but Smith, who’s committed to NCAA D-I Edinboro, are freshmen. Ours was also named the Hercules Award winner with the most pins in the least amount of time in the championship bracket. He pinned his way to his title over Meadowbrook’s Terry Gatrell in 5:58. Beaver Local, who also claimed the Class 4A title, scored 303 points to Parkersburg South’s 243. South had won eight of the last nine overall titles since joining the OVAC. Salsberry started the championship finals off right for the Beavers with a pin of John Marshall’s Carl Cochran in 1:10 in his championship final. Severs had his hand raised in his final after defeating Steubenville’s Ethan Pappas, 7-5. Smith, who had two OVAC runner-up finishes to his name, won his first OVAC crown in his decorated career by topping Bridgeport’s Santino Kusic with a 7-5 sudden victory. Beaver Local wasn’t the only area team boasting champions. In an all-local affair in the 113-pound final, East Liverpool’s Howard Williams beat Oak Glen’s Shawn Moore with a 6-4 sudden victory to earn his second OVAC title in as many tries. He was first at 106 as a freshman. 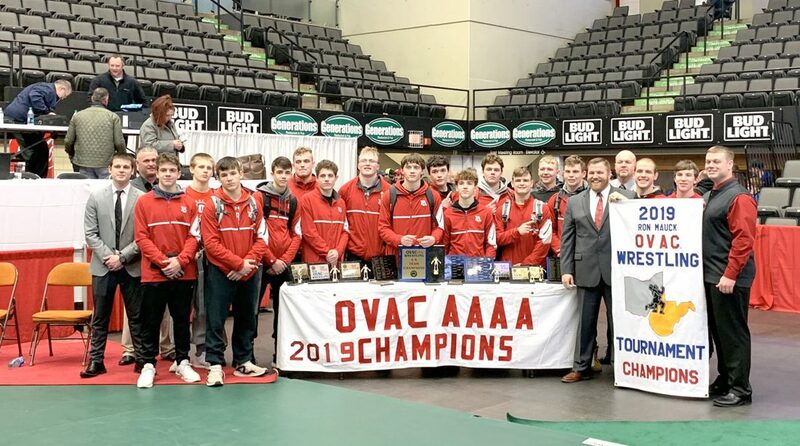 West Virginia University recruit and Oak Glen junior Peyton Hall returned to the top of the OVAC podium as he pinned Steubenville’s Jacson Muldrew in 3:30 to claim the 138-pound championship. Hall was a champion as a freshman and a runner-up as a sophomore. ¯ Steubenville’s Peyton Blasko won the Bierkortte Award for the Most Outstanding Wrestler as he scored a 6-5, ultimate-tiebreaker win over Beaver Local’s two-time champion Cole McComas in the 126 pound class. Blasko, a senior, had lost his three previous meetings with McComas including a loss in the 120-pound OVAC final last season. McComas, a top-seeded junior who is also a two-time Ohio Division II state runnerup, dropped to 23-5. ¯ Steubenville’s Anthony Rice, 29-2, won his second straight title with a 9-4 nod over Beaver Local’s Logan Krulik in the 152-pound final. He is ranked No. 1 in Division II in the Buckeye State. ¯ Beaver Local’s Skyler Lasure enjoyed his weekend as he earned his 100th career win early Saturday before falling to Parkersburg South’s Brayden Roberts by a 1-0 count in the 145-pound final. ¯ Beaver Local’s Jonathan Potts advanced to the 132-pound final as a No. 3 seed but fell to top-seeded Jacob Simpson of University with a 6-4 sudden victory. ¯ Beaver Local’s Daniel Wirth suffered a 9-1 major-decision loss to Parkersburg South’s Louden Haga in the heavyweight title. ¯ Mark Emmerling, a four-time OVAC tournament champion at East Liverpool, saw his son Mark Emmerling Jr.. finish fifth at 113 pounds for Beaver Local on Saturday. The junior Emmerling is the first son or daughter of a four-time OVAC champion to wrestle at the tournament. ¯ Parkersburg South’s Samantha Miller was the first female wrestler in OVAC tournament history to advance to the championship quarterfinal round on Friday. Miller failed to place however.